On September 6th, 2017, Hurricane Irma, a category 5 hurricane with maximum sustained winds of 295 km/hour, became one of the most powerful hurricanes ever recorded in the Atlantic. This highly destructive hurricane approached the eastern coast of Cuba (in Guantánamo) on Thursday, September 7th. Hurricane Irma battered the entire north coast for 4 days. At 8:00 p.m. on Monday, September 11th, the hurricane finally left Cuban territory leaving a huge amount of devastation in its wake. Approximately 2,000,000 persons were evacuated from their homes and sought refuge with their relatives, neighbors, in emergency shelters or in local churches. Tidal surges measuring up to 9 meters in height came crashing down on the coastline. 10 human casualties were reported as direct result of the hurricane. Irma has caused considerable environmental, economic and social damage throughout the country; more specifically, there is inadequate supply of safe water for human consumption; significant loss of coastal dunes, forests, fruit trees, as well as seed granaries, banana and other crops; total or partial destruction of houses, health and educational centers, markets, bridges and access roads to those communities. Widespread flooding promoted unsanitary conditions which have resulted in health issues. Many communities remain without electricity and telecommunications, due to extensive infrastructural damage to the national network. The tourism industry, the main source of income for the Cuban economy, was seriously impacted, due to the destruction of hotel infrastructure. All this has seriously affected the psychosocial well-being of vulnerable groups, especially elderly persons, children, teenagers, youth, women, persons with disability and persons with chronic illnesses. 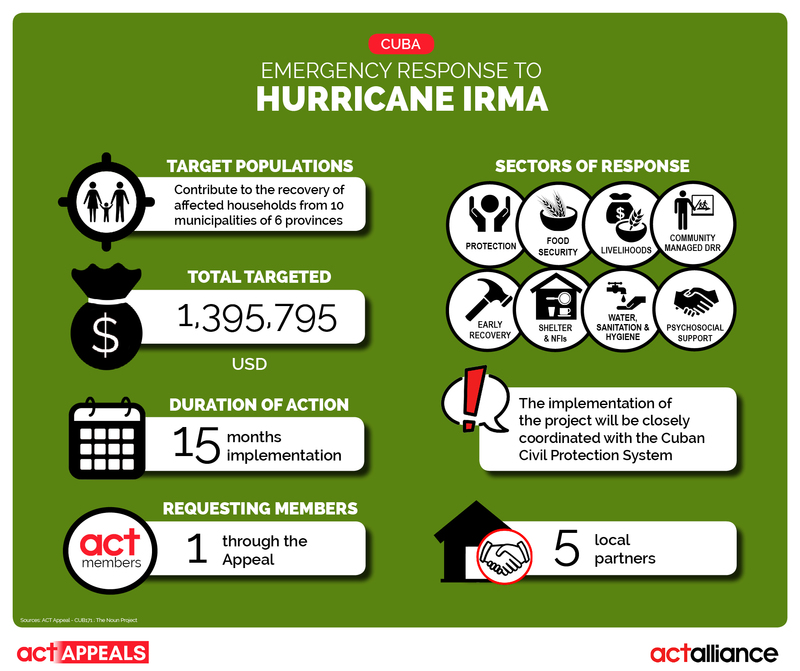 The Cuba Council of Churches (CIC) an ACT Alliance local member in the Cuban Forum are supporting the Hurricane affected households to have sufficient food, access to safe water and sanitation, Psychosocial support, shelter rehabilitation, and livelihoods recovery. Over 20,000 households in 75 communities will be benefited by this intervention, the requested budget for this intervention is 1, 395,795.00 USD.